Vladimir Akopian: I liked this place very much. We visit different countries and cities but we haven’t known that you have such beautiful places. I really liked them and the air. This place is quiet. Yesterday we visited a hypermarket. I saw such big shops only when I was abroad. I liked the town very much. It is neither big nor small. More over the weather is fine here. We go for walks very often with great pleasure. If I have any opportunity to come here just to have some rest, I will come with great pleasure. Boris Gelfand: I liked Nalchik very much too. The town is wonderful. The air is remarkably fresh; here are beautiful parks and wonderful nature. We are given cordial welcome here that happens quiet seldom nowadays. Rustam Kasimdzhanov: Of course, everything is all right. I am not so successful at the tournament as my today`s rival Peter Leko. But in general the organization of the tournament is on the high level. Life and playing conditions are decent. There were no problems with people too. Peter Svidler: I am satisfied with everything but my play. Everything was wonderful but the end of the tournament has spoiled the impression a little. But, of course, it is not the fault of Nalchik. I should have played better. The conditions are very good. Sergey Karjakin: I can say the same: we were given a good welcome but I played bad. I was impressed by the tour to the Blue Lakes. One of the Lakes is 235 meters deep. It is incredible. It would be interesting to swim there in summer, if it is possible. Alexander Grischuk: My wife used to tell me that it is good here but it turned to be better. I liked the air very much. We visited beautiful places on the day off. Among them are the Blue Lakes. I haven not been to the mountains before and I liked them greatly. Etien Bacrot: Everything depends on the last game. Now I think only about the tournament. Vassily Ivanchuk: I can say that I have only good impressions of Kabardino-Balkaria, Nalchik and its people. I will remember the excursions. I am very grateful. Most of all I like the tour to Prielbrusie. It is unusually nice. Evgeny Alekseev: The organization of the tournament is on the high level. 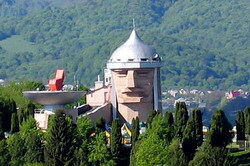 If there is an opportunity to come to Nalchik again I will come to visit the hot springs. Levon Aronian: If to take into consideration that chess players are not capricious in food and that we had not enough time to visit restaurants I can’t say much about the local cuisine. Unfortunately I can’t say about the taste of your shish kebab, because I don’t eat meat. But the things that we were offered to have were very tasty and delicious. Gata Kamsky: Unfortunately I can’t say much because I have been bit ill during the first half of the tournament and didn’t go to the Blue Lakes. I liked the organization of the tournament very much. The organizers were very attentive to us. In general it is pleasant to be here. Pavel Eljanov: Everything is organized on the high level. I must say that it’s not only words. People are doing everything to make the participants feel comfortable. When the tournament was held in Dresden last autumn the chess players were kept within the bounds, many rules were imposed. So we couldn’t feel comfortable. Here everyone is so hospitable and cordial. I like the places of interest. One can come here to have rest. Shakhryiar Mamedyarov: In fact everything is wonderful. Besides the fact that you have beautiful hotels, fresh air and high leveled organization you also have nice people. It is really important for us and we know that our opinion is also important for the organizers. Believe me, I am sincere now.